Our New Brunswick employment lawyers represent employees in all areas of employment law throughout the state of New Jersey. The New Brunswick sexual harassment lawyers of Smith Eibeler represent residents and individuals who work in New Brunswick and Middlesex County in claims of Discrimination, disability discrimination, Unemployment Appeals, Sexual Harassment, race discrimination, pregnancy discrimination, reasonable accommodations, and wage payment violations. Our law firm is located in Monmouth County at the Bell Works building in Holmdel, New Jersey. New Brunswick is a municipality within Middlesex County, which is located in central New Jersey. New Brunswick is bordered to the north by Highland Park and Piscataway, to the west by East Brunswick, to the south by North Brunswick, and to the east by Somerset County. New Brunswick has a total area of 5.789 square miles, which includes 0.562 square miles of water. The town is home to several large parks, including Buccleuch Park, Alice Jennings Archibald Park, Boyd Park, and Feaster Park. New Brunswick is located along the southern bank of the Raritan River, making it a convenient location for transport into New York City. New Brunswick was established in 1784. According to the 2010 Census, there are now 55,181 people, with 7,751 families, living in the town. The median age of New Brunswick residents is 23.3 years old, and in 2010, the median income of New Brunswick households was $44,543. New Brunswick is very ethnically diverse, and there is a large Hungarian population in the town. 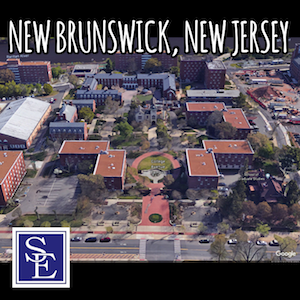 Various employers in New Brunswick include Rutgers University, Johnson and Johnson, Bristol-Myers Squibb, Jersey Avenue Associates, Easy Prep Tax and Accounting, and Staff Management Group. Because of the large amount of hospitals and medical facilities in the area, New Brunswick is known as the ‘Healthcare City’. The New Brunswick school system serves 10,230 students. Elementary schools in New Brunswick include Lincoln Elementary School, Livingston Elementary School, McKinley Community Elementary School, Roosevelt Elementary School, and Woodrow Wilson Elementary School. New Brunswick Middle School is the town’s middle school. New Brunswick High School and Health Sciences Technology High School are the town’s public high schools. Institutions of higher education in the area include Rutgers University, Robert Wood Johnson Medical School, and Middlesex County College. Famous persons who live or have lived in New Brunswick include Jim Axelrod, Gary Brokaw, Jonathan Casillas, Robert Wood Johnson, and Joe Theismann. Restaurants in New Brunswick include Clydz, Steakhouse 85 Restaurant, and Catherine Lombardi Restaurant. New Brunswick is also home to Crossroads Theatre, the George Street Playhouse, and the State Theatre. The Municipal Court of New Brunswick is located at 25 Kirkpatrick Street, New Brunswick, New Jersey. Our New Jersey employment lawyers can file a lawsuit and have it properly venued in Middlesex County Superior Court if one of the parties lives in Middlesex County or if the employer regularly conducts business within the county. Should you or a family member have an employment related legal issue and are in need of a New Brunswick employment lawyer, please call our office today to discuss the facts and circumstances of your employment related legal issue.